Calm and sunny outside, but it was windy in the program room! We began with the storytime routine. 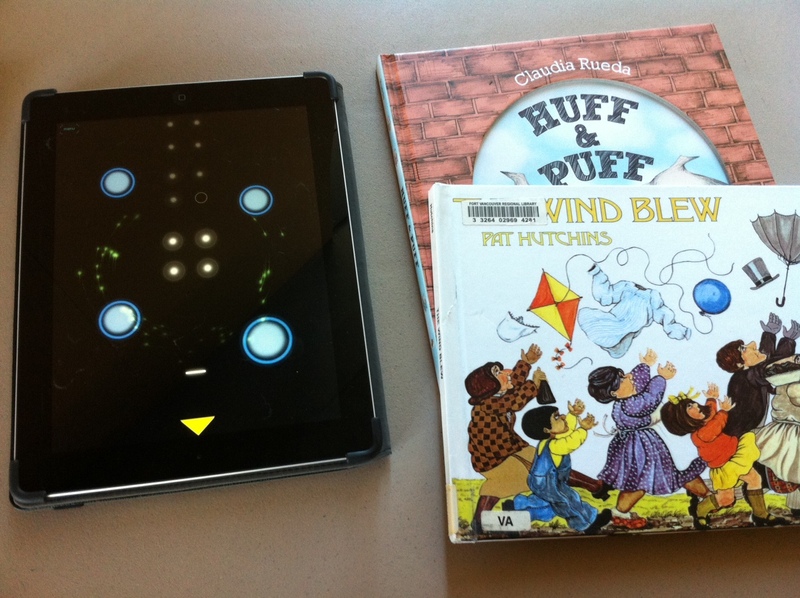 This week we read The Wind Blew by Pat Hutchins and I demonstrated a super cool app called Ocarina 2. You blow into your iPad or iPhone to make music! They were amazed. Stretch a balloon over the mouth of an empty water/soda bottle. 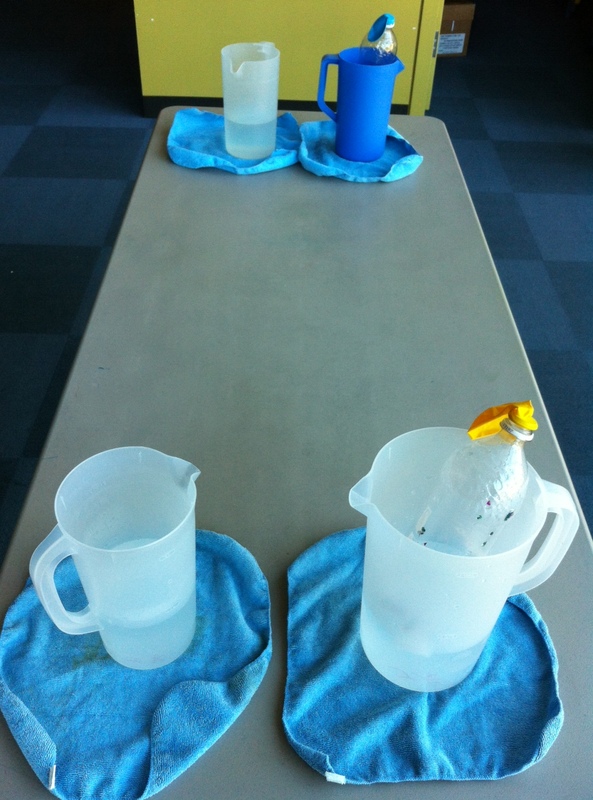 Place the bottle in very cold water (I used pitchers), then place the bottle in very hot water. Watch the balloon blow up! I demonstrated this before letting them loose and they were totally amazed. The moms were even blown away. “How does it do that?” The kids spent a long time going from cold to hot to cold to hot making the balloon blow up and collapse. 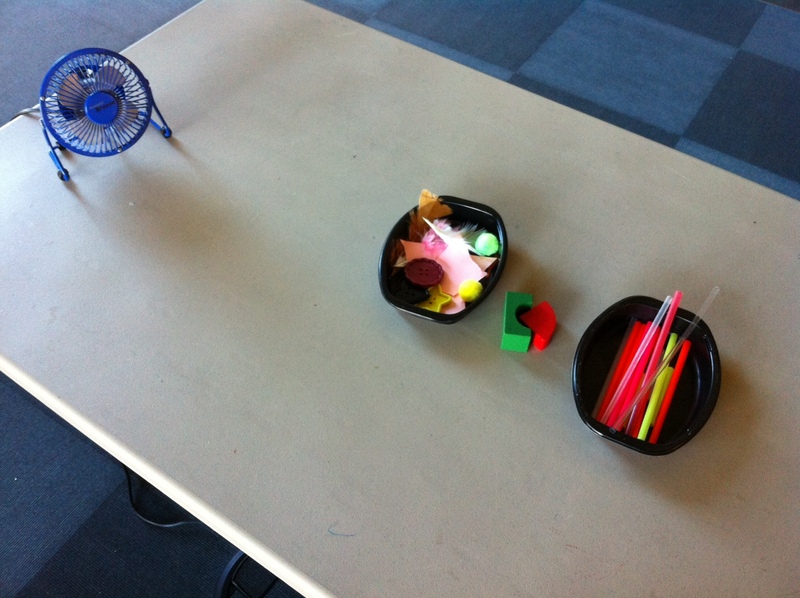 The kids made pinwheels using pencils, thumb tacks, and origami paper or cardstock. They made one of each and tested them on the next station. Great scissor practice! 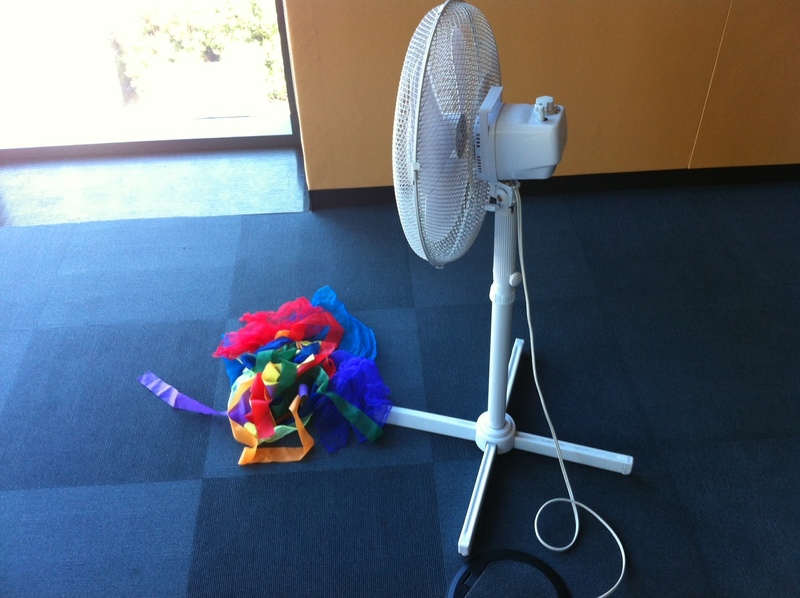 They tested their pinwheels and played with scarves and dancing ribbons in front of the fan. I’m sure none of you will be surprised to learn this was the second most popular activity. Kids love fans and seem to be able to stand in front of them all day (or behind… “Luke, I am your father”). WonderWorks: I pretty much replicate everything they do. It’s amazing and SO FUN. The Show Me Librarian: You had all better know about Amy already. SO much inspiration here for my STEAM programs. 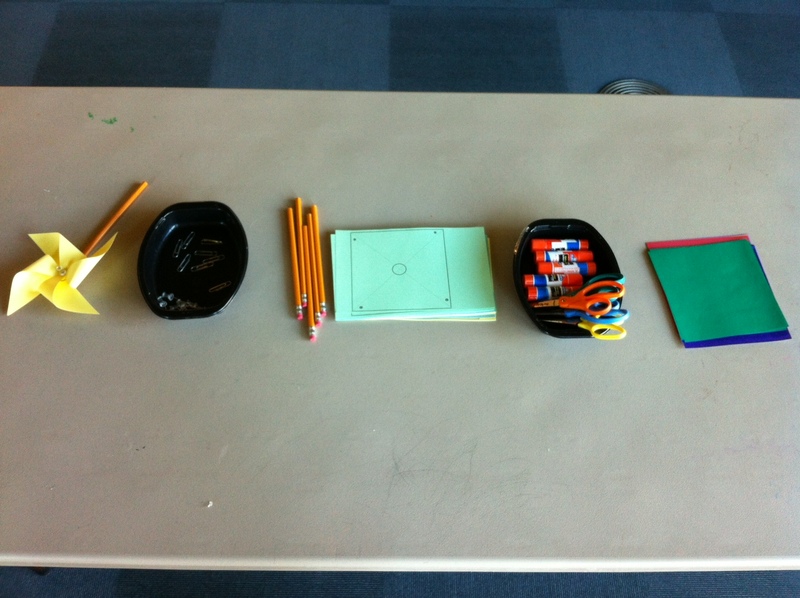 Categories: STEAM | Tags: preschool, stem, storytime | Permalink. Nice! Thanks for sharing this great program. Thanks for the comment, Melisa! Hi Kendra! Thanks for sharing this program! You inspired my next Little Learners program and I think it’s going to be a lot of fun. Have a wonderful Thanksgiving! Hooray! Glad it was helpful. How do you keep the hot water hot throughout your storytime? Would warmish water work? The hotter it is, the more dramatic the effect. But, since we obviously don’t want kids to burn themselves I just made it as hot as possible for the start of the program and it was fine. I did have the tea kettle ready in the back and filled a cup with hot water and dumped it in the pitcher later on. If your water is not very hot you can also try putting more ice in the other pitcher so the temperature would still be different. Because they are going back and forth the water temperatures are going to change. If you want to keep the effect get an electric tea kettle to have handy. Hope that helps! This is great! We start another session of Preschool Storytime next month, and I can’t wait to try out the app you mentioned. Thanks for sharing your ideas! Thanks for the comment! Have fun!